TALES FROM THE QUADEAD ZONE: Insanity Rises From The Shot-On-Video Tomb – Schlockmania! 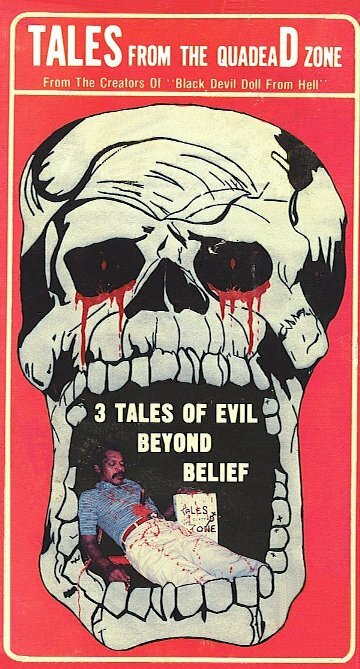 If Chester Turner never made another movie after Black Devil Doll From Hell, he would have already made his mark on horror history. After all, that the film is one of the most utterly screwy examples of outsider art masquerading as entertainment. However, Turner was a determined man and returned to the shot-on-video realm a few years later with Tales From The Quadead Zone. Though it’s not as outlandish in terms of content as his previous shocker, this little bit of camcorder wackiness cements the Turner legacy with its thoroughly outlandish concept of how horror filmmaking is supposed to work. This time, Turner steps things up in the ambition department and treats his audience to a horror anthology. The wraparound story focuses on a mom (Turner muse Shirley Jones) telling tales to a son who is either invisible or undead. The tales she tell him include a story about a family driven to vicious extremes by hunger and a tale of sibling rivalry that extends beyond the grave. The wraparound story becomes the final segment, offering an explanation of what’s going with the unseen son, some dimestore splatter effects and Turner’s charmingly wacko idea of a happy ending. The results are less assaultive to the senses than Black Devil Doll From Hell but no less eccentric. The story about the hungry family is fascinating because it makes no sense at all: it’s like hearing a four year-old kid tell you a story that they make up as it goes along. The second story feels like an amusingly low-rent version of a Tales From The Crypt episode and boasts a hilarious extended monologue about the brotherly rivalry. However, its the wraparound story that is the killer: it boasts some delightfully chintzy “video toaster” visual FX, a fight sequence where the emoting and the choreography compete for laughs and a high drama finale for Jones that rivals her performance in Black Devil Doll From Hell. Turner gives her a trash-horror aria to work with here and once again, she gives it her community theater-style all. On the filmmaking side of things, Turner broadens his scope but keeps his style comfortingly similar: the home movie camerawork, el cheapo special effects and elemental “Radio Shack keyboard” synth score are all in place. He’s much more pace-conscious here – the whole thing runs just over an hour – but he lets his filmmaking id roam freely. The wraparound finale in particular just wobbles to and fro in terms of narrative, covering everything from slasher-movie theatrics to a weirdly heartfelt try at tragic drama. The end result is satisfying in its own demented way. 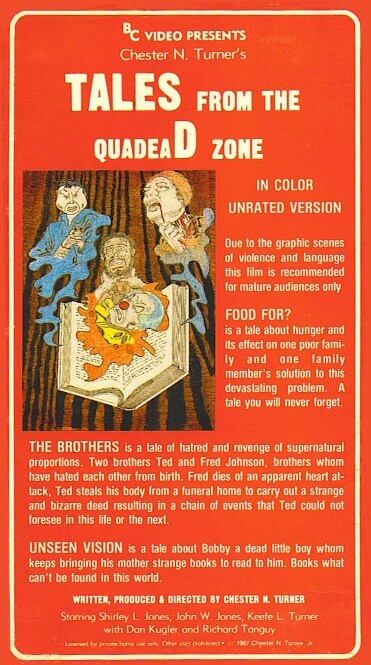 There’s little more that can be said about the film other than this: if someone was to say they don’t make them like Tales From The Quadead Zone anymore, the only logical response would be that no one ever made movies the way Chester Turner did before or since. Most will have their brains scrambled by this film’s outlandish approach to horror but fans of shot-on-video horror will treasure it for its defiant, totally personal oddness.